I rarely use event rules for anything but calling AWEs. Recently I've been forced to use event rules to connect with a certain vendor. Can anyone tell me how to NOT log failures when successfully connecting to a client and not finding a file to retrieve? I'd like to put an e-mail notification after the 'move' (login and retrieve) action to notify me of real connection issues. Failing to pick up a file doesn't concern me. I see that it could be useful, just not in most cases. Note: the 'move' action to place a file has an option to treat the attempt to upload as a success if EFT has nothing to upload. It's the download 'move' action that is missing this feature. Hi jstarkweather. Thanks for responding! In all cases, I'm using a scheduled event rule. When I need to download from the server, I'm using a 'Download file' action. When I need to upload to the client, I'm using a 'Move file' action. So, let me change my question slightly because I just noticed an error within my original question. Within the event rule, I'd like to put an e-mail notification after the 'Download file' action. Because there is no option to treat the failure to download a file as a success, when I add an e-mail notification (upon failure), I get e-mails. Many of our processes check hourly because the vendor releases files throughout the day. I've added 4 screenshots to help clarify. 2. 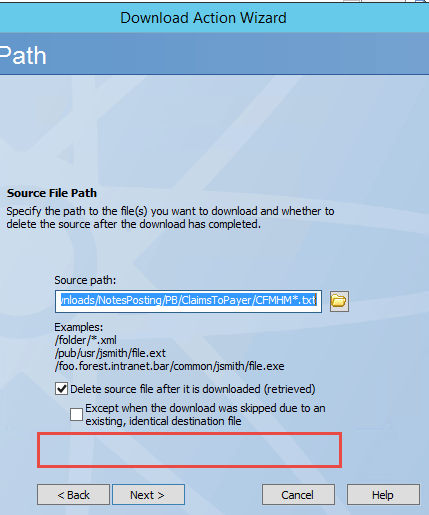 Server Connection with Download File Action 2 <-- Download Action screen, which is missing the option to treat the download as a success if there are no files to download. 4. Client Connection with Upload File Action 2 <-- Offload Action screen with the option to tread the download as a success if there are no files to upload.